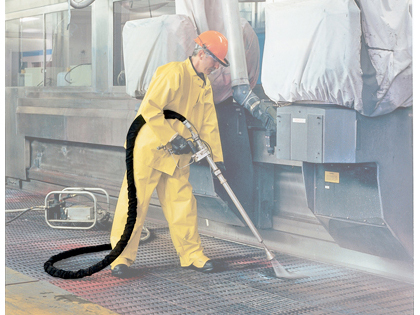 A whip hose helps protect operators from potentially dangerous hose failures. It is typically short (10 ft. (3.05m) max.) and covered with a dense fabric or reinforced plastic that diffuses energy in the event of a hose burst. NLB offers 11 standard assemblies and 3 special whip hoses. These include special whip hoses with a heavy-duty rubber shroud and a special 90-degree elbow. Attachment to your hand lance may require additional fittings.